Reach & Read: Bees – Nature’s Little Wonders – Odds & Hens : Ramblings. Creations. This well researched book about bees is a must read for anyone, beekeeper or not. Ms. Savage presents a very well researched book covering four big buckets: world, home, field and life lessons. Intertwined are lovely and varied illustrations, prose, wit, wisdom and of course, more reasons that I can shake a hive tool for people to champion or keep bees. It is also a “required” reading for you to achieve Intermediate Merit Badge for Bees. 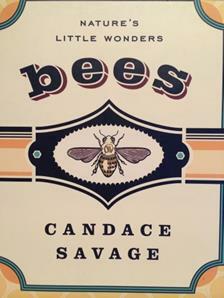 I will definitely bee reading more by Candace Savage, she has quite the library. “The life of bees is like a magic well. The more you draw from it, the more there is to draw” – Karl Von Frisch. Hey! Remember him? He and others came up in my research about Nazi idealism prompted after reading the Zookeepers wife (review and ramblings here). This chapter goes into even more depth on his research but pulls in interesting twists from Aesop, reminds us of the many varied species of bees and shares Ralph Waldo Emerson’s The Humble Bee poem. Von Frisch appears throughout the whole book. This chapter introduced me to the wild world of Emily Dickinson and her poems about bees and gardens. While poking around a bit learning about Emily’s “A Bee Experience“, I found a new blogger penned by someone in the same great state as I. “Go to the bee, then poet, consider her ways and be wise.” George Bernard Shaw. While very little in this book talks about the disappearance of the bees, it ends with a rather ominous poem by Betty Lies (1998), titled End Notes for A Small History. … Nobody wrote an elegy for to apricots……Of concentrated grape juice and orange juice, stores stocked with artificial flavoring….